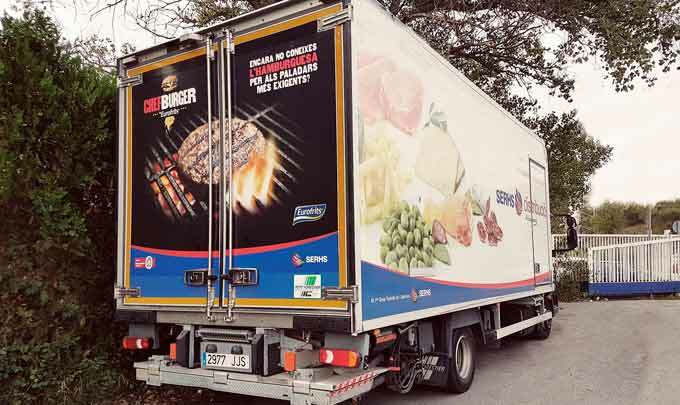 Very soon, SERHS Distribución trucks, a leading platform in the comprehensive product services for the catering companies, will show on their back doors the picture of our Premium ChefBurger range. Trucks from the Valencian Community will join to those already on the Catalonian roads due to the renewal of the “campaign on wheels” carried out by both companies. This is just one of the actions binding us in a business relationship that can already be described as “long-standing”. A business relationship that almost started in parallel with Eurofrits creation when SERHS Distribución began distributing different Eurofrits potato specialties & precooked products. In 2013 this business relationship was “entered into an Agreement” becoming “partners”, being Eurofrits strengthened as the sole fries supplier as well as a preferential supplier of precooked products with more than 35 references. In 2017 the framework contract was renewed for another 5 years being forecast to increase both Aviko fries & Eurofrits precooked products in 2018 specially in Typical Tapas range and the new product launches. SERHS Distribución is one of the leading and reference companies specialized in products and services for the hotel & catering industries in Catalonia, East of Spain and Andalusia areas. Created in 1975 in the municipality of Calella, the company is a corporation formed by 58 companies, structured into 6 business divisions (distribution of perishable and non-perishable products, tourism & travel, food production & management, projects, services and new technologies). They currently have an average workforce of 2,500 professionals and more than 1,400 shareholders being considered as “The first Tourist Group of Catalonia” to meet the demands of more than 40,000 customers.